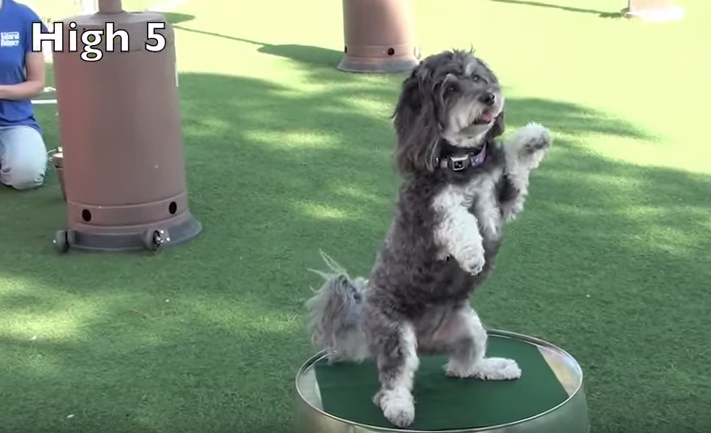 Jasmine is a super talented pup that can do a lot of tricks! You may watch a lot of these and think, “My dog could never do that!” Although dogs aren’t born with the natural desire to push a shopping cart or fetch drinks from the fridge, they do have the desire to please their humans, and they love the praise and reward that goes along with it. Here are some training tips for a few of them to get you started! To get your dog to put his paw in front of his face, you’ll need something to entice that action. Gently place a small piece of tape or a sticky note on the snout right above your dog’s nose. Make sure your dog is in a “lying down” position…if he’s standing or sitting he might try to shake it off rather than using his paw (training sessions for this trick should be kept fairly brief, as this could become an annoyance to your dog). When your dog uses his paw to remove the tape, immediately reward with a high-value treat, whatever that may be for your dog. 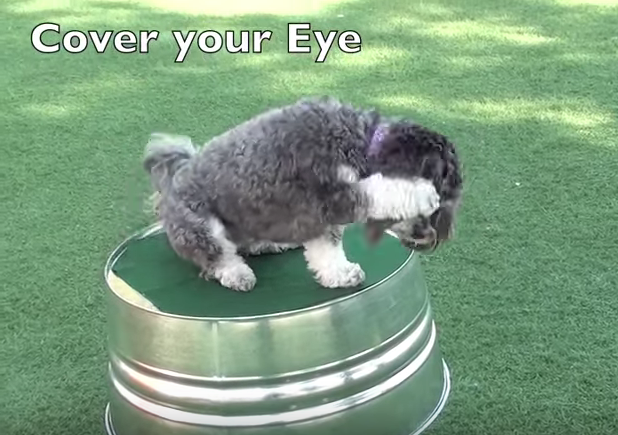 As he gets used to using his paw to remove the tape, add the verbal cue “Cover your eye!” Make sure to reward every time he performs the desired action. Now start doing the same, but with your dog in a sitting position. Once your dog is consistently “covering his eye” stop using the tape, and simply touch his snout, then give the verbal cue. After he’s performing the action without the tape, gradually stop touching his snout, and only use the verbal cue. If you’ve already taught your dog to shake paws, you’re a step ahead. But even if you haven’t it’s still a fairly easy trick to teach. Start with a treat in one hand. Most dogs will try to paw at something they want. When your dog paws at your hand, give him the treat. Make sure that you’re only giving the treat when he uses one paw, not two. After your dog is pawing at your hand with one paw consistently, make a high five hand signal. When he paws at your hand, give him a treat. After he is doing this consistently, add in the verbal cue “High Five!”. A little bit more work using the hand sign with the verbal cue and you can phase out the treats. As you do a waving motion with your hand, add in the verbal cue “Wave!”. 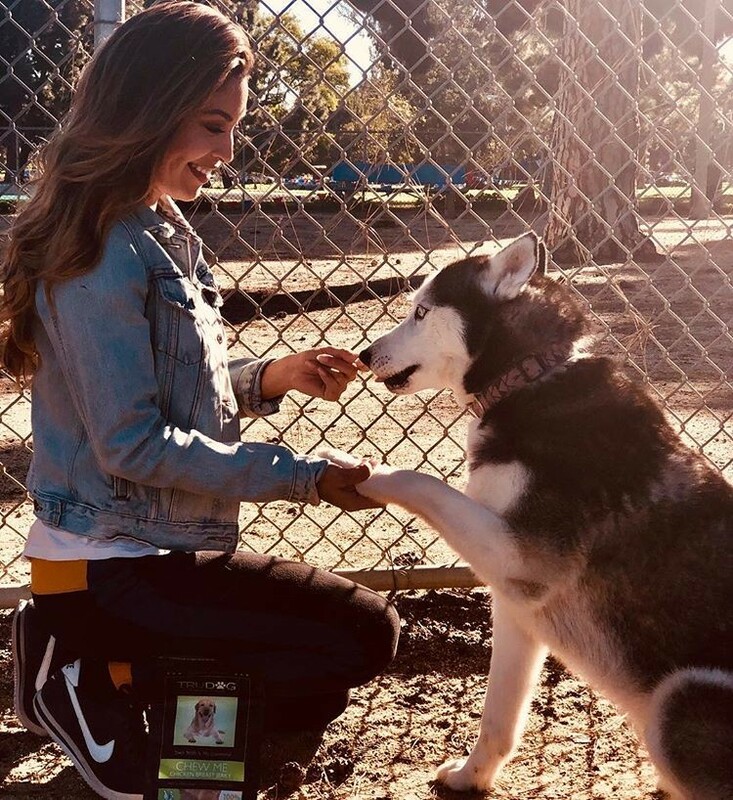 As with the high five, using the hand sign along with the verbal cue, continue to give small treats until your dog is consistently “getting it” then phase out the treats. Start by placing a sticky note on the door and work toward getting your dog to touch it with his nose. As he begins touching it with his nose, give him a treat. If he doesn’t show interest right away, try rubbing a treat or some food on the note so he can pick up on the yummy scent. Once he’s touching it consistently, add in the verbal cue “Door!” every time he touches it. Continue to praise and reward. As you’re working on this, gradually move it closer and closer to the door, eventually putting it on the door. Once he’s consistently touching it while it’s on the door, open the door about 1/4 of the way. As he touches it, reward him anytime the door moves at all…gradually working towards closing it all the way. Repeat the process with the door open farther and continue to give the verbal cue “Door!” each time. Now move to opening the door all the way. 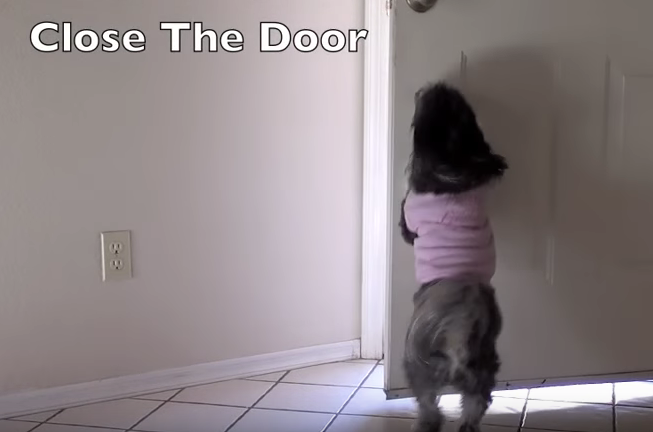 Hearing the verbal cue, and knowing the note is not between the door and the wall, your dog should nudge it with his snout to get the process started. Continue to give the verbal cue, only rewarding once the door is completely shut. 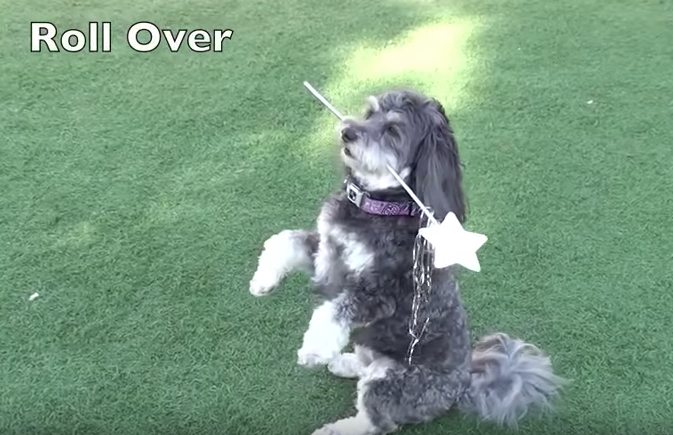 Using a high-value treat, bring your dog into a “down” position. Once in the down position, give him the treat. Once your dog gets the down position, grab another treat and put it in front of your dog’s nose…lifting his head so his weight shifts onto his side. From there, hold another treat in front of his nose, and have him follow it slowly as he rolls over to his other side. Once he’s on his other side, it’s important to lay the treat down out in front of him rather than giving it to him. This will force him to complete the roll by getting back upright to grab the treat off the floor. Once you’ve done this a few times, start incorporating the verbal cue “Roll Over!”…leading him with a single treat through the entire roll, rather than using multiple treats as at the beginning of the process. No matter how difficult it may seem to teach some tricks, they all have the same basic principles. Using high-value reward, we teach a physical action and accompany it with a verbal cue. Once they’ve got that down, we replace the treats with praise. Pleasing their humans is our fur babies’ greatest reward. Just remember that training should be upbeat, fun and exciting for both you and your dog. 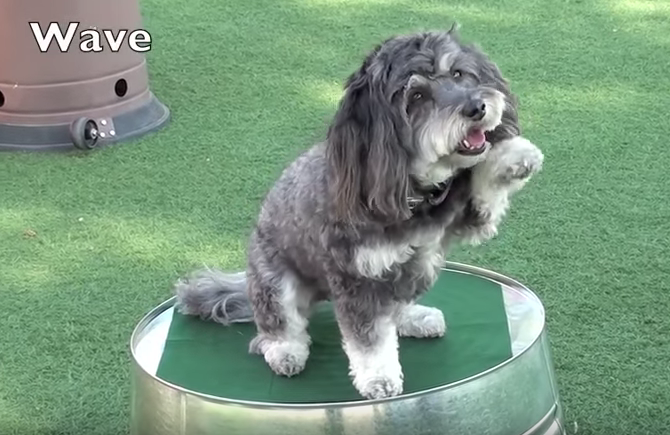 With patience, a good attitude, and plenty of praise and rewards, any dog can learn to do some of these cute tricks. Are you looking for delicious, all-natural treats to use as your “high value” training reward? 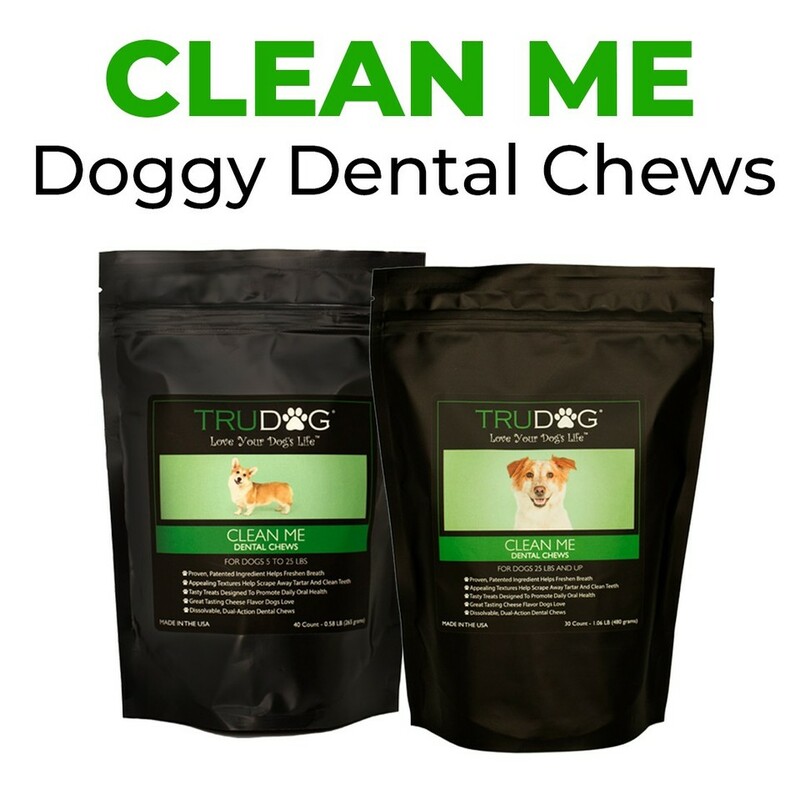 TruDog offers a full line of wholesome, natural treats that your pup will love! Check them out by clicking here!